I have a problem with litespeed and that is not letting my users upload large file (I paid a lot of people but no one could solve the problem), I also have a problem with apache as well which is not being able to handle all of the connections, so i was wondering is there a way to use apache for remote uploading but using litespeed on another port (let's say 8080) for downloading the files, if yes how can i do that in server settings. Can you post your ATOP SS? How much connection do you have on apache? QuadCore CPU, 16GB Ram and good optimization can handle 2K connection easly. My old server can handle 3,5K-4K with high loads on Apache. ufkabakan wrote: Can you post your ATOP SS? I'm currently using litespeed BUT if i switch to apache it would only work for about 10 minute and then server would be un-accessible! You can handle easly 2-3k connection on Apache with this hardware. You need good optimized Apache and Linux Kernel configs i think. You can see my lowerspec server with handle 1600-1700 connections on ATOP ss. I can handle on my same lowspec server 2,5K connections on peak hours. 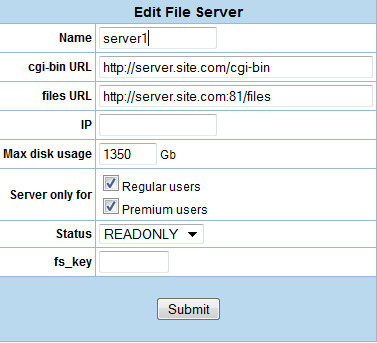 Be sure to block cgi-bin on litespeed! Is it possible to download the files from port 8080 and use apache as default?? if yes can you send me a picture of the settings i would have to do in server configuration in XFS?? I run an older version, but it's probably the same. Can you paste/share your nginx.conf file in here? What happens when you just change the port in mysql directly?